Welcome to this week's Simple Friday! Giving a BIG shout out to everyone who left a comment about what I should do with my blog design. I appreciate every comment. Please stop by often and check out some of the changes I'm making, gotta keep it fresh peeps, right? Today I am excited to share with you my friend and fellow blogger Ange from The Blooming Hydrangea. Ange is full of energy, fun loving, and such an inspiration to me. She and her family made a big move this past summer and she hasn't stopped yet. 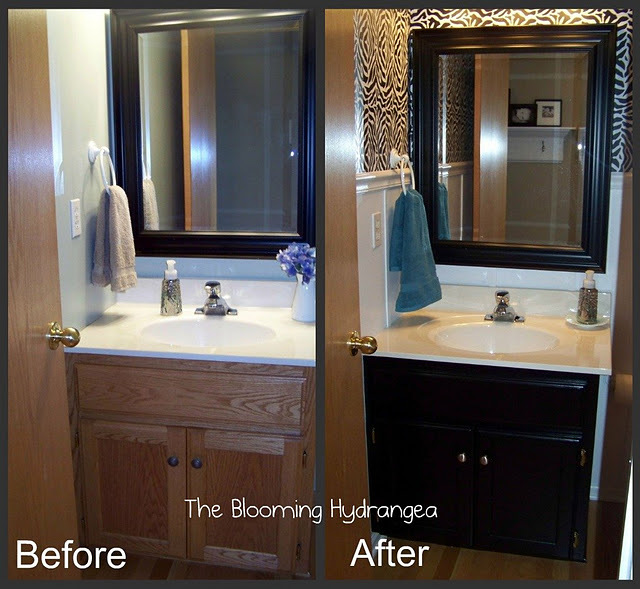 Here's a sneak peak of her Powder Room Gone Wild makeover. This is just one of many projects she's completed in their new home. Go see Ange and I promise you'll be inspired. Enjoy! 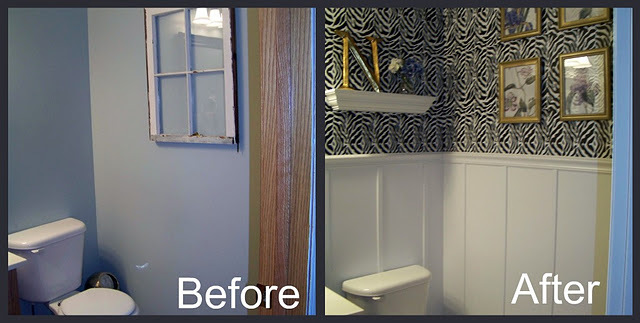 Since she had started painting her oak trim in the hallway she brought it into the bathroom too. Then she painted the vanity black, isn't it amazing how these little changes make such a difference. Love how Ange's bathroom turned out!!! She is amazingly talented!! Visiting from her blog today and excited to be following you!! Wow, that is awesome. Love how wild yet modern it looks. Thanks for sharing! Great bath Ange! I am in the middle of making one over....thanks for the inspiration!